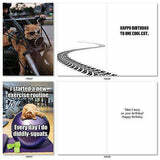 10 HAPPY BIRTHDAY CARDS - Inside text varies depending on card. 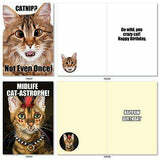 If you're looking for a set of hilarious greeting cards perfect for birthdays for friends and family of all ages, then look no further! 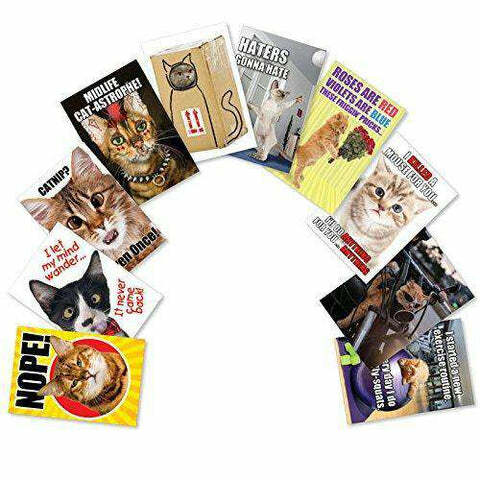 These cards feature a variety of photos of chatty cats with hilarious, coordinating sentiments. 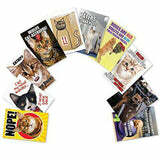 Personalize each card with your written message inside each puurrfect card. Ships with envelopes and reusable box. 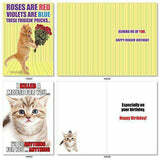 4'' x 5 Â¼'' CARD SET - Mini 4'' x 5 Â¼'' bday cards with envelopes. 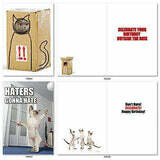 Showcases photos of different cats offering hilarious birthday wishes. These funny cats may have nine lives, but you've only got one! Pounce on this offer today! We offer a wide assortment of designs and art styles, offering a unique match for men and women looking for the right note card for their special, personal message. LEAVE A LASTING IMPRESSION - Perfect, high-quality stationery for writing notes for birthdays. All mini greeting cards ship with an envelope & arrive boxed for your convenience. They store easily in a home office, desk, or at a business. A variety of the art and designs in our note card sets look great framed! Try framing them individually, or grouping several in a collage frame, to create visually appealing wall decor. ABOUT THE CARD - Keeping US jobs at home, most of our products are Made in the USA (some printed in Canada) for more than 38 years, unlike our off-brand Chinese competitors! We print our Christmas greetings on snow white, thick, recycled cardstock, made from renewable farmed trees. Our Print on Demand technology is a modern (we no longer use papyrus, naturally) eco friendly, reduces waste and minimizes environmental impact.